It really has changed my life & helped me to see the world and experience so much. Emma gave me tools to help me. Was useful to understand myself and about not putting too much pressure on myself whilst going through a stressful time. E.G not beating myself up over not hitting the gym 4 times a week. The sessions helped me to focus and gave me the skills needed to feel calmer and more in control. I feel much calmer and more focussed; my head’s not racing and there’s no intrusive thoughts. I feel more motivated and able to function. Best of all I enjoy doing things again. After a years of IBS-like episodes- panic attacks, severe stomach pains, tingling in the chest- I decided to do something about it. I found Emma on the internet, and have just finished a series of four sessions with her. I am now entirely symptom-free, but even more important than that, I can now see how attitudes formed in childhood caused years of unhappiness. And I now have the tools to deal with any such problems which might recur in the future. To put it simply, I now feel more balanced and self aware than I have done for years. Emma is sympathetic, professional and searching. Having established a safe environment, she acts as a guide, encouraging you to explore areas of experience which might have been suppressed. She leads you carefully to an understanding of what the problem is, and then gives you the tools to resolve it. She is kind. She takes you seriously. I would thoroughly recommend her her services to anyone. I DID IT!!! I GOT MY PLACE! Exeter Uni here I come 😀 Yaaaaaay! Just wanted to share this blooming marvelous news with you, and to say thank you very, very much for all your help with my exam nerves! For the first time in my life I managed to eat and drink sensibly over Christmas (and enjoyed it!) but haven’t come back with bad habits, which is what has ALWAYS happened in the past. I’m facing the New Year full of positive thoughts and my eating is exactly where I want it. Whatever you said or did clearly hit the right button… Normally Jan/Feb are miserable for me, but I feel great! I have done brilliantly, I haven’t smoked any at all and I haven’t gained weight either. Thank you for helping me with something so important with my health and life. I know I can come back to you if I weaken but I won’t. Just thought I’d drop you a line to let you know how things are going……very well! I feel TOTALLY different in the business, and in myself. I’m dealing with people exactly as I want to, on an equal footing. Amazing! My sense of humor and fun are back, my decision making, its all back and better than ever! Thank you so much for your help, I’ve gone from rock bottom to +10 in 4 short sessions, just the hand up I needed. Prior to arriving at the event I was nervous and shaking but it did not feel out of control. On the day, a few changes were made, past experience tells me I should have crumbled at that point and gone straight into panic mode. Amazingly this did not happen?! The social gathering afterwards was another challenge for my personality and again this did not appear to be as much of a struggle as it usually is. Without your help I would never had been able to attend the event. The whole experience has been amazing and unbelievable. I think I may book for ‘top-ups’ when my exams come round or just for boost! Thank you, Thank you! The no smoking is going brilliant, a few slip ups but nothing major. Feel loads better and I’m tasting my food so it’s all good. Thank you so much. 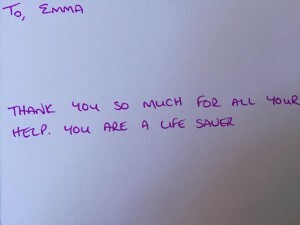 Emma helped me overcome my strong fear of having blood tests. She used a range of methods to help me relax and trust my rational side, which I was then able to apply outside of our sessions. Her approach is calm and patient and I feel she has helped me make a lasting change to my life. I was a bit unsure what to expect when I made my first appointment for hypnotherapy. When I met Emma I quickly realised that the TV hypnotists are a world away from the profession of hypnotherapy. I was aware of what was happening the whole time. It’s so easy and relaxed I wasn’t sure whether it would have any effect, but it definitely did. I began to feel an improvement after the first session, even my family noticed a difference in my mood. There is no dwelling on painful memories, or bad habits, it?s all quite fast moving, and the focus is on “moving on”. Emma uses a variety of techniques, it is relaxed and natural with the emphasis always on the positive. 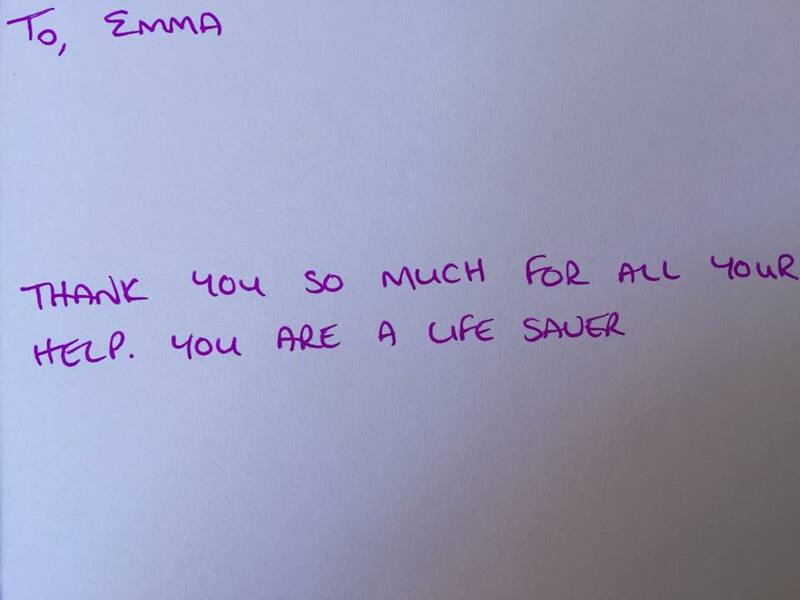 Emma is very professional, not at all judgemental and she’s approachable and there to help. I feel it’s opened up a whole new world for me because it has removed barriers that have been there for many, many years.